The publicly-owned Puerto Rico Electric Power Authority (PREPA) released on Jan. 23 a draft of its 2019 integrated resource plan (IRP), adding cleaner energy resources to the island’s grid over the next 20 years. The utility’s plan to add over 2,220 MW of solar and 1,080 MW of battery storage would also phase out its use of coal and bunker oil, expensive energy fuels the island imports. PREPA plans to build three liquified natural gas import terminals, despite legislative efforts in Puerto Rico to move to 100% renewables last year. PREPA, which had more than $9 billion of debt before the 2017 Hurricane Maria knocked out power for the island, noted in the IRP the potential privatization of its generation assets. PREPA’s $9 billion debt consolidation deal last summer was expected to clear the way for its privatization. 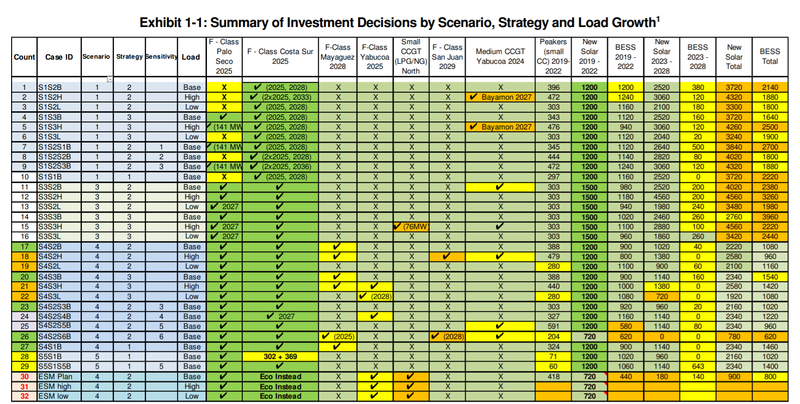 The draft includes scenarios for the largest build-out of solar and battery storage in the country, according to the environmental advocacy group Sierra Club. Puerto Rico’s IRP identifies microgrids that “could be owned by the utility or private entities,” including eight self-sufficient zones of resiliency, called MiniGrids, ensuring local resources can serve loads during and after major storms. PREPA worked with Siemens’s network planning subsidiary, Siemens Power Technologies International, to forecast various scenarios in its IRP. Siemens investigated nearly 80 long-term capacity expansion plans, of which a final set of 32 plans were recommended. Placing an emphasis on the first five years, the plans include a maximum amount of renewable generation integration along with distributed resources and hardening the transmission and distribution grid to successfully segregate it into MiniGrids. “This is essential in order to mitigate, manage and enable timely recovery from a major storm, while shifting the traditional generation from largely heavy fuel oil and distillate fuels to cleaner natural gas,” the IRP states. PREPA’s draft IRP shows the potential of investing in utility storage with a mix of two-, four- and six-hour lithium-ion batteries. Siemens reviewed the potential of customers going completely off the grid, anticipating that residents would need solar and at least a 6-hour battery to fully self-supply. The island’s Sierra Club chapter and other Puerto Rico activists continue to resist plans to privatize the utility, in order to maintain the residents’ control of the public utility’s actions. Environmental and consumer advocates have also worked to transition the island to more affordable, cleaner alternatives than fossil fuels, and are pushing back on the development of any new gas facilities, according to Sierra Club. The utility is expected to file its finalized IRP by Feb. 12.